Folks...look...if the U.S. had advanced, energy-efficient transportation like the GG1 in the early 1930's the bottom line is why this is such a rarity across the U.S. now? Why did we allow General Motors and Firestone Rubber (and all the oil companies in tow!) to destroy the Los Angeles public railway system, back in the 1940s and 1950s, so they could make $$ off us by selling us polluting cars, oil/gas and tires? It's our fault. Obama seems to realize this and wants to save the U.S. by investing in rail. Let's at least back him up on this part of his "economic stimulus" plan (most of which is a corporate-backed sham, but investment in RRs is real). Top: Before the advent of axle- mounted traction motors, the designers depended on complex jack-shaft and side- rod “monkey-motion” machinery to transfer electric power to the drivers, as in the DD-1 2-B+B-2 of 1910. Built to replace steam for the trip under the Hudson River, they operated until 1933. Second from top: The 1-C+C-1 FF-1 of 1917 eliminated the connecting rod from the motors with direct gearing linked to a flexible spring wheel. “Big Liz” was simply too powerful and was not duplicated. Third from top: The L5 1-B-B-1 of 1925 continued the geared, drive-wheel design and developed 3,070 continuous hp, pulling trains at 70 mph (112 kph). The limitations of the side-rod design proved unsatisfactory. Bottom: By the 1930s, electric-motor designs bad advanced enough to abandon the jack-shaft and side-rod drives. The L6 1-D-1, with 2,500 hp in its traction motors, proved too light, however, and a large number of partially completed units were scrapped. The Pennsylvania Railroad, which had promoted itself as “the Standard Railroad of the World” and continued to pay dividends, was, nonetheless, hard hit by the economic stagnation of the 1930s. Despite the ravages of the depression, the Pennsy pressed ahead with the electrification of its eastern lines. This project, mammoth by any standard, was to encompass 2,677 miles (4,283 km) of trackage between New York’s Penn Station and Washington, D.C., and represented 40 percent of the nation’s electrification. This vast construction project inspired the design of a new high-speed electric locomotive, but no new locomotive springs up magically. The steps leading to the proto type GGI began with “Big Liz:’ the 1—C+C—1 design for the FF1 of 1917, a low-speed freight hauler with side rods, intended for the anticipated, but stillborn, electrification of the main line over the Alleghenies. The next step in evolution came with the 1-B+B-1 L5, visualized in 1924 as the universal locomotive, suitable for both freight and passenger service with a simple gear change. 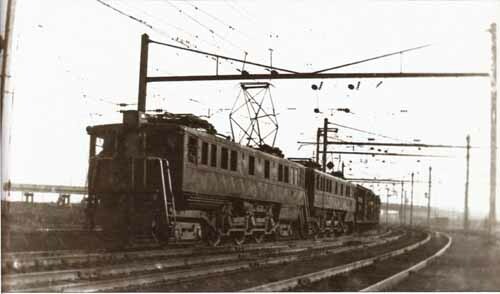 The L5s, along with “Big Liz” and the third-rail-powered DD1 of 1910, were jack-shaft and side-rod powered, as electric motors small enough to fit on the axles, between the drivers, were not yet powerful enough for the heavy demands of mainline railroading. 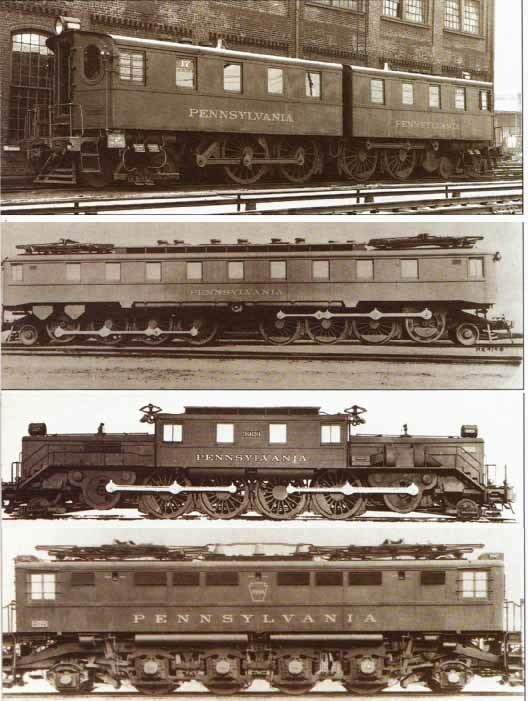 In 1927, the Westinghouse Electric Company developed a suitable motor, and construction of prototypes for three locomotive classes began, all sharing the new motors and a number of interchangeable parts: the L6, a 1-D-1 2,500-hp freighter; the P5, a 3,750-hp 2-C-2 for heavy passenger service; and the O1, a 2,500-hp light passenger loco in a 2-B-2 configuration. The most promising of these prototypes seemed to be the PS, and an order was placed for ninety production P5a’s, with the box-cab body design common to all three versions. A 1934 grade-crossing accident that killed the engine crew caused the last twenty-eight P5a’s to be built with a safer center-cab design that included the tapered nose and streamlining that became the hallmark of the future GG1. Philadelphia to New York passenger service began in 193 3 on the newly electrified line powered by the P5. Unfortunately, it proved to be underpowered and unstable, and had a habit of cracking driving axles. To realize the high-speed benefits expected from the costly electrification project, the company had to continue its search. Despite the Pennsy’s tremendous research and development efforts of the previous seventeen years, it was a leased EP3a 2-C+C-2 box cab from the New Haven that pointed the way to the GGI. Brought to the new Claymont, Delaware, test track, the flexibility of the articulated 2-C + C-2 chassis, with the weight and horsepower spread over more axles, impressed the brass enough for a prototype GG1 to be ordered. At the same time, they also ordered the R1, a design that perpetuated Pennsy’s undiminished faith in rigid frame locomotives, with a 2-D-2 chassis that used fewer driving wheels to carry the weight and horsepower. The P5 2-C-2 began in 1931 as a box-cab design, as illustrated by this 1937 double- beaded freight in Newark, New Jersey. The box cab style was abandoned after a crew was killed in a collision between a PS and an apple truck. The design was mod to a center-mounted “steeple cab” in later construction, leading to the classic GG1. 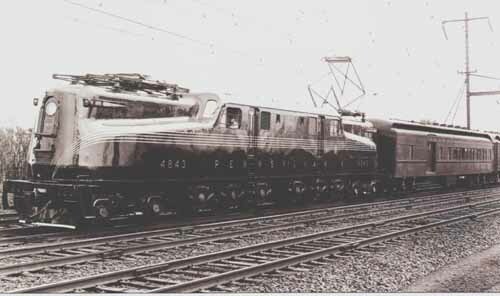 When the two prototypes were delivered in August 1934, the proud PRR had assigned the class number 4800 to their own RI, while the “outsider” was assigned 4899. In a series of head-to-head trials at Claymont, the GG1 was clearly superior, so the R1 was not replicated, and the GG1, now numbered 4800, was ultimately joined by 138 of its kind. A $15 million order for the first fifty-seven units, financed through a Public Works Administration loan, was called “one of the largest locomotive orders in the history of American railroading” by Railway Mechanical Engineer. 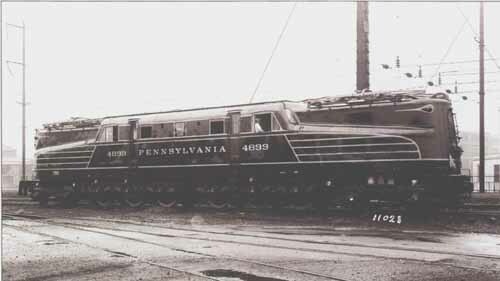 It was placed with a consortium of General Electric, Westinghouse, Baldwin Locomotive Works, and Pennsy’s own Altoona Shops, all collaborators in the design. They were joined by Gibbs & Hill, engineers for the electrification project. Serendipity entered the project when Raymond Loewy, a noted industrial designer, was added to the team. He had originally been retained by PRR management to redesign trash receptacles for New York’s Penn Station; the GG1 project was his second for the railroad. Loewy’s philosophy is probably best explained by the title of his autobiography, Never Leave Well Enough Alone, and that thinking was applied to the already satisfactorily engineered GG1. Loewy’s own words, as quoted by Karl Zimmerman, best describe the process: “They built one prototype of the GG1. It was entirely riveted, with overlapping metal sheets. So what I suggested right at the start was that they weld the entire body of the locomotive. I told them, ‘Why build this when we can do it better,’ so they gave me a chance?’ The presentation of a clay model and some renderings shocked the railroaders, since welding the entire shell was an automotive building technique, and not indigenous to the rail roads. “Brute force can have a very sophisticated appearance, almost of great finesse, and at the same time be a monster of power. That’s what I tried to do. The GGI is almost an understatement?” Ultimately, management was persuaded to try these new ideas and the design refinement continued. To Loewy’s advantage, he was starting with an already symmetrical center-cab design, based on the “safety cab” P5a’s, that had been organically contoured in the interest of crew visibility. Those designers attempting to cope with the streamlining of steam locomotives were not so lucky! The most important of Loewy’s changes was the smoothly welded one-piece shell, unbroken by overlapping metal plates or rivets. But he also made subtle contour changes, modified the air-intake grilles and marker lights, eliminated the number board “bumps” atop the nose, and removed steps leading up the nose to the roof. In addition to the sleeker, more streamlined appearance, this smoothing of the shell resulted in better aerodynamics and reduced manufacturing and maintenance costs. Except for the revolutionary welded shell, the changes were small, but in combination they were extraordinary. The streamlined Brunswick Green GGI was ready for production, and none too soon. Its statistics were impressive: 4,620 continuous hp, with 8,000 available short term; a chassis weighing 460,000 pounds (207,000 kg); a length of 79 1/2 feet (24.2 m); articulated construction; driver diameter of 57 inches (142.5 cm); maximum starting effort of 72,800 pounds (32,760 kg); six pairs (one pair per driving axle) of twin traction motors; quill drive; 11,000- volt, 25-cycle, single-phase power; and gearing for 90 mph (144 kph). On January 28, 1935, with the temperature hovering near zero, a Washington/ New York round trip test run for government officials and dignitaries was made. The 134-mile (214 km) southbound run, including a Baltimore stop, took 110 minutes with the sprinting preproduction model, known as Rivets, No. 4800. The average speed exceeded 73 mph (117 kph), but a portion of the run was timed at 102 mph (172 kph) without stretching the GG1’s capabilities. Regularly scheduled Washington to New York electrified passenger service was inaugurated on February 10, with the departure of the Congressional Limited behind GG1 4800 on the northbound run and P5a 4780 departing New York. By August 1935, all fifty-seven GG1s of the original order were in service and the P5a’s were re-geared for freight service. The GG1s were an unqualified success, cutting the time of the Congressional Limited from four and a quarter hours to three hours and forty-five minutes. By April 1936, it had been cut again to three hours and thirty-five minutes. These schedule reductions were possible because of the GG1’s tremendous acceleration and its ability to storm up grades at no loss of speed, thanks to the short-term overload capacities of the electric motors. The only significant failure of the GGI happened in February 1958. Bitter-cold weather and high winds combined to create a snow so fine that it penetrated the French linen air filters, melted, and shorted out the traction motors, thereby eventually disabling almost the entire fleet. The Wilmington shops couldn’t keep up with the losses and as many as seventy GG1s were out of service at once, causing the cancellation of numerous trains. This was the worst passenger service failure in the history of the PRR. Above: Old Rivets, the original GG1, was built in a 1935 joint venture by Westinghouse and the Pennsylvania Railroad and was the model for the restyling by the noted industrial designer Raymond Loewy. Above: Loewy convinced the Pennsylvania Railroad management that welding the body was preferable to riveting, allowing for smoother edges and simpler construction. The GG1s survived in large numbers until environmental regulation and old age forced their retirement in 1983. A unit is preserved at the Pennsylvania Railroad Museum. The P5s had not suffered from this freakish problem, and the railroad deter mined that the snow crystals formed at the same elevation as the GG1’s air intakes, while the higher intakes of the P5 were immune. The problem was resolved with a modification to the ventilation that put the air intakes in a bulge on the roof, and forty units were redone. This solution worked, but was aesthetically unfortunate, and was the only major change, other than paint schemes, ever made to Loewy’s original designs of the 1930s. The GG1s served the Pennsylvania Rail road faithfully for many years, the first retirements not coming until March 1966; 75 percent of the roster still remained in 1976. Most outlived their master, surviving Penn Central and hauling trains for Conrail, NJDOT, and Amtrak. They appeared in many different paint schemes from black to red, white, and blue to silver over the years, some because of special occasions, sometimes in response to cost saving measures as railroads struggled for survival, and ultimately because of changes in railroad ownership. They hauled crack passenger trains, football specials, and the funeral train of Robert Kennedy. But, like all mechanical things, their replacement eventually became necessary. The age of the remaining GG1s began to show, particularly in fatigue and corrosion in the main frames. 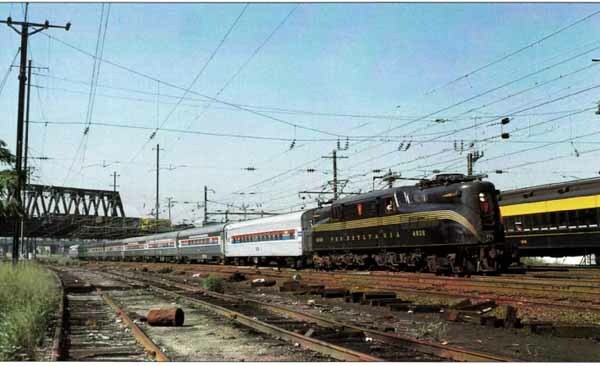 Amtrak ordered E60s from GE and Metroliners from Budd in the 1970s, but in a repeat of history, the E60s had tracking problems that limited speed to 85 mph (136 kph) and both succumbed to another siege of unusually cold weather in the winter of 1977, while the Gs rolled merrily along in their twilight years. Suddenly no longer being taken for granted, GG1s were being preserved for historical purposes. Amtrak cooperated with a volunteer group called Friends of the GG1, with Raymond Loewy as honorary chairman, which raised funds and succeeded in restoring Loewy’s original railroad triumph, Amtrak No. 4935, an unmodified GG1, back to its original Brunswick green-and-gold “cat whiskers” glory. Amtrak performed mechanical and electrical work, the sheet metal was repaired and painted, and the 4935 reappeared in its original form. Restored No. 4935, nicknamed Blackjack, slips past HunterTower, New Jersey, looking as it did fresh out of the Altoona shops almost fifty years earlier. Although it was his first major assignment, the GG1 outlasted everything else that Loewy designed for the railroads, but the last run was finally made when another restored GG1, New Jersey Transit Pennsylvania 4876, along with freshly repainted black 4882, and freshly retouched black 4879, hauled farewell specials on NJ Transit’s Matawan-Newark line on October 29, 1983. Although several were saved in muse ums, the GG1 was gone from the main line after almost fifty years, and with it, the last of the Loewy designs for American railroads. January 15, 1953, was not a good day in the history of the Pennsylvania Railroad’s magnificent GG1 electric locomotives The overnight Federal from Boston, hauled by 4876 was southbound and approaching Washington Union Station when its brakes failed. Running out of control the GG1 punched through the station bumping post rumbled through a news stand and the stationmaster s office and surprised travelers when it burst into the elegantly arched concourse and sank through the floor There were no fatalities and the 4876 was cut into sections hauled out of the basement and sent to Altoona for rebuilding The rebuilt unit served the PRR faithfully, finishing out its days hauling commuters for the New Jersey Department of Transportation. The Strasburg Railroad, an eastern Pennsylvania short line known primarily for steam excursions, had a surprise visitor on December 14 1976. Conrail’s GG1 No.4855 had burned an axle bearing on the main line at Parkersburg and was towed by the Strasburg’s steamer, 2-6-0 No 89 to their shop s drop table for repair.